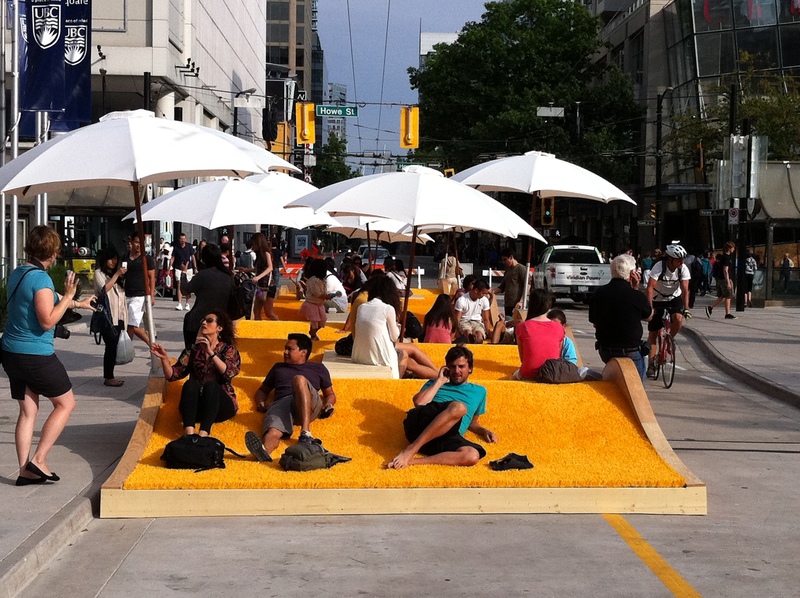 During the summer of 2009, Picnurbia, an undulating 116 square meters of yellow astroturf hillocks, arrived on Vancouver’s Robson Street. Designed as a downtown alternative to out-of-town beach trips, Picnurbia acted as an extensive picnic blanket for city residents and visitors. The installation offered pedestrians a much needed gathering space in the heart of the city. Originally, the installation temporarily occupied a single lane of traffic, as its designers at Loose Affiliates, in collaboration with the municipal program Viva Vancouver, turf supplier SYNLawn, and engineering firm Fast + Epp, established the installation as a “summertime node”. 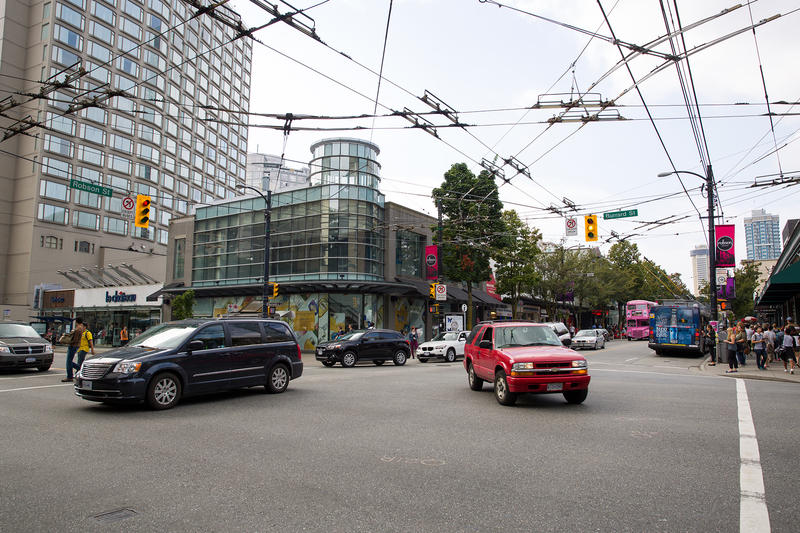 The popularity of the project led public space advocates to circulate a petition to permanently close the block to all motorized traffic, which gathered 1,167 signatures in just a few weeks. Now, the 800-block of Robson shuts down to auto traffic every summer in a seasonal extension of Robson Square. Picnurbia exemplifies the positive potential of LQC in planning; initiated as a temporary activation, Picnurbia allowed city-goers to view Robson Street as a pedestrian-friendly rather than a car-prioritized site, so much so that proponents mobilized to enact long-term change in the public space by petitioning its annual closure to automobiles. 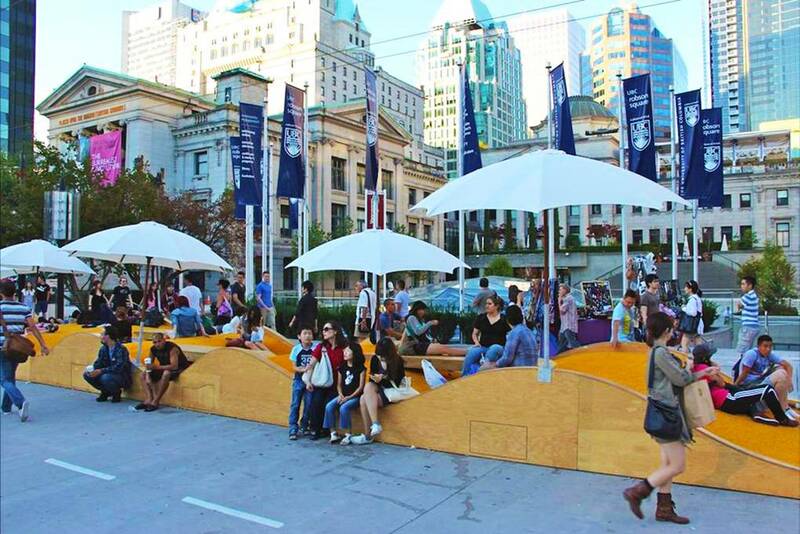 The annual closure of the 800-block of Robson Street and its activation is facilitated by VIVA Vancouver, the city’s program to turn “road spaces into vibrant people spaces”. The installation was constructed using SYNLawn astroturf, timber, and plywood. Picnurbia took a full day to completely install and lasted an entire summer. The exact cost of Picnurbia is unknown but it is estimated to have cost around $100,000.